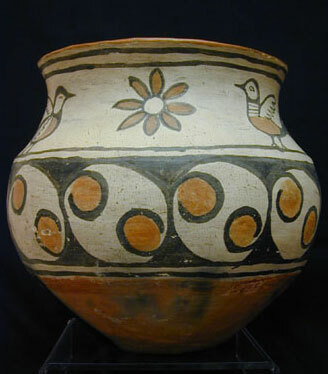 This San Ildefonso Pueblo polychrome bowl, with deeply concave base, is painted in orange, black, and red against a creamy tan slip, and a red-slipped band around the top of the rim as well as the lower portion. The decorations include: four birds, two floral rosettes, a black band of ten circular medallions each enclosing two scrolling painted circles. The rim is flaring. There are some firing clouds present in the lower portion.